The Centro de Preservação Cultural (CPC) was established in 2002 as an organ of the Pró-Reitoria de Cultura e Extensão Universitária of the University of São Paulo. The CPC inherited from the former Comissão do Patrimônio Cultural, established in 1986, the role of promoting actions and reflections about the preservation of the University’s cultural heritage, including its monuments, collections and memories. It is responsible for the formulation of guidelines and policies for the preservation of the university heritage; the inventory of USP’s cultural property; fostering and developing upgrading programs and documentation about it and advising processes of restoration, intervention, incorporation and alienation. In 2004, CPC-USP headquarters – formerly located in the University campus – moved to a historic building in Bixiga, which enabled the increase in cultural activities and university extension, and has since introduced on its agenda actions of museum comunication, heritage education, dissemination of expertise and cultural socialization through research, workshops, courses, lectures, symposia, exhibitions, guided tours and artistic performances. These activities have been contributing to deepen and diversify the links between the university and society. To access the Centro de Preservação Cultural, click here. 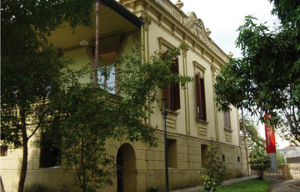 Its current headquarters, the Casa de Dona Yayá, a building labeled by municipal and state authorities, was transferred to USP in 1969 as part of the inheritance of Sebastiana Melo Freire, known as Dona Yayá. The domicile has an eclectic style, which was typical of the architecture from the end of the nineteenth century and beginning of the twentieth century; it was built on the remains of a brick cottage from 1870. In the 1920’s, this property became Dona Yayá’s household, who, since then, showed signs of psychological disorders. The house was adapted to her particular medical conditions, and turned into a private psychiatric asylum, until her death in 1961. Since the house was incorporated into the University’s patrimony, surveys and historical studies were developed, guiding its preservation and culminating in the CPC-USP proposal, which aimed at ensuring its public destination as a place of memory, where its uses and activities should necessarily be linked to its historicity. Its restoration earned the Prêmio Rodrigo Mello Franco de Andrade, an award given by the Instituto do Patrimônio Histórico Nacional (IPHAN), in 2004. The CPC-USP was recently reorganized and structured in areas that facilitated the division of responsibilities, the coordination of investments, the continuity and coherence among actions, the compatibility between the organ’s objectives and the competencies and talents represented in its staff: Construction, Sets and Sites; Archives and Collections; Education and Memory; Promotion and Cultural Interaction; Documentation and Information.